The most effective diagnostic and therapeutic decisions in the least time! A best seller for over 25 years, The5-Minute Clinical Consult 2018 is a practical and useful resource for clinicians in primary care, family medicine, emergency medicine, nursing, and pediatrics. It provides rapid access to guidance on diagnosis, treatment, medications, follow-up, and associated factors for more than 540 diseases and conditions. The5-Minute Clinical Consult 2018 is designed to deliver maximum clinical confidence as efficiently as possible…allowing you to focus your valuable time on giving your patients the best possible care. 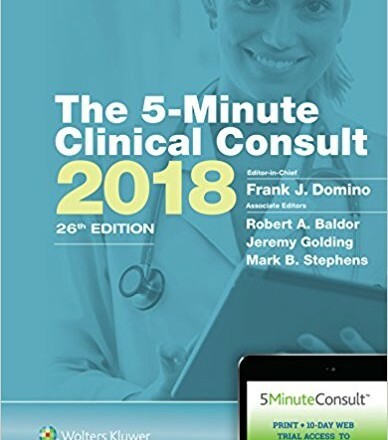 Written by esteemed internal medicine and family medicine practitioners and published by the leading publisher in medical content, The 5-Minute Clinical Consult 2018, 26th Edition includes a Free Trial to 5MinuteConsult.com.